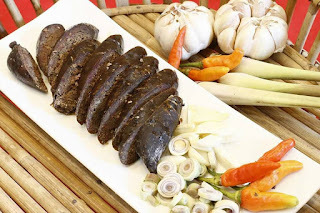 In Savannakhet, one of the local delicacies is a sausage made of beef and spices which is stuffed into either the intestine or the gallbladder of a cow. Called “Mum“, it is both a symbol of the province and a favourite gift item of tourists and visitors alike. Indeed, Mum has already received the prestigious “One District One Product“ (ODOP) certification from the relevant government departments of Savannakhet province specifically given to the Food Processing Group of Nalao village, Kaysone Phomvihane district, Savannakhet province. Since the group has received the ODOP certificate a few years ago, the overall sales have really risen. “It creates more income for all members in the group,” Ms. Kingdao Sorphouthavong said on behalf of the group when she was displaying her products at Lao-ITECC in Vientiane recently. This sausage is a provincial specialty and most of her customers are those working in Savannakhet province, who visit her group in Nalao village regularly to buy Mum sausage. In addition, there are some tourists and visitors from other provinces coming to work in Savannakhet for a short time and they come to buy Mum sausage for their friends or relatives as souvenirs for their return home. Mum sausage comes in two types; Mum thong bee is made with the gallbladder and Mum sai ngua which is made with cow intestine. So far, the products of the Food Processing Group, of Nalao village, are already known around the country. She wants to thank the government for approving her group to become a member of the ODOP scheme. Receiving the Certificate of ODOP helps the group in a positive way as it provides them an opportunity to sell their products at various trade fairs in the country. “This is a market channel that helps to increase the overall sale of the group’s products,” she said. In addition to producing meat sausages such as Mum sausages, the group also makes Xeensavanh dried meat, dried frogs, and traditional chilli sauce. These products are popular with customers, and the products retail from 10,000kip. “Gallbladder sausages are more expensive because a cow or a buffalo has a small, short gallbladder which can help make only one sausage. In contrast, a cow or a buffalo have long intestines, which allows us to make at least 10 sausages from a single cow or buffalo. Nonetheless, customers do like the bitter taste of gallbladder sausages,” she said. Ms. Kingdao said that customers should be confident with the quality standard of the products, as every step of production has been overseen by the relevant government departments, which is one of the regulations of the ODOP scheme. All raw ingredients are fresh and clean, and no preservatives and no chemical favouring is added. To make Mum sausages, firstly, the intestine and gallbladders are cleaned with fresh water. Then the beef chopped up and mixed in with the other ingredients before being stuffed into the intestines or gallbladder and then dried in the sunshine. The local tip is that if you want a tasty sausage, it should be dried for two sunny days. The main ingredients that are used in making Mum include ginger, galangal, garlic, salt and roasted rice. These ingredients are then pounded to a fine powder before being mixed with the meat in a clean and a hygienic way. A resident of Vientiane, Mr. Khonkham said that he visited Savannakhet many times in the past. On every occasion he bought Mum sausages and Xeensavanh dried meat to give to his friends and relatives when he returns home. “They always ask me to buy it whenever I visit Savannakhet,” he said.